was John Southerland. But his brother George Southerland was business owner and then in partnership with John in Tuscumbia; and their father, John Sutherland is buried at Oakwood Cemetery in Tuscumbia. John’s nephew, William DePriest Sutherland attended LaGrange Military Academy before heading to Texas and his name is mentioned in numerous accounts of the events. ©1936, The Naylor Company, San Antonio, Texas. Written in 1860 and now published for the first time an authentic account of that tragic event in the history of Texas compiled from facts known to the author and supported by evidence of others who were witnesses to the siege and fall of the Alamo together with a sketch of the life of the author by his grand-daughter — Annie B. Sutherland. 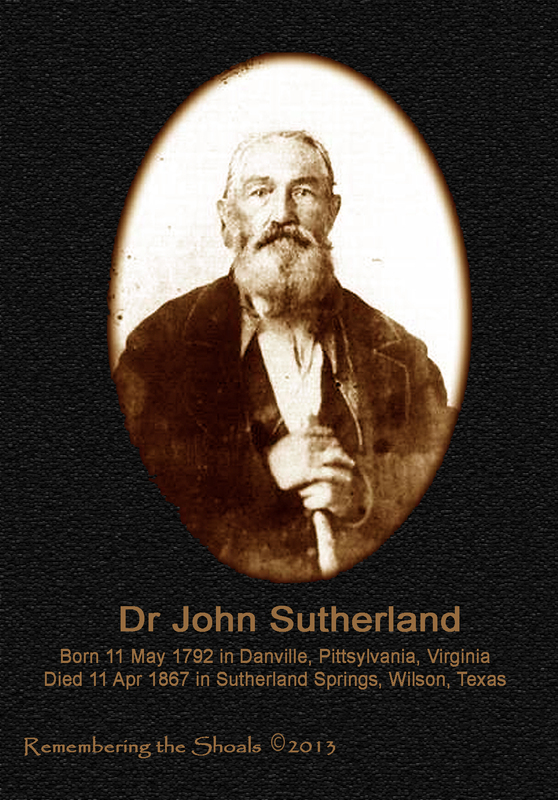 Dr. John Sutherland was born in Virginia May 11, 1792 on Dan River near the site of the present town of Danville.His father Captain John Sutherland, or Sutherlin as the name was then called, was an officer in the Revolutionary War. Of sturdy Highland Scotch descent, his forefathers emigrated to America in the early days of its history.Captain John Sutherland with his family, following the westward trend of emigration, moved from Virginia to Tennessee in 1805 and settled on Clinch River, where he kept a ferry known as Sutherland’s Ferry. At the age of young manhood, John Sutherland, Jr. went to Knoxville where for several years he clerked in a store for a man named Crozier. Later he became a partner in the firm. About 1824 he moved with his family to Decatur, Alabama, where for a time he was president of a bank. 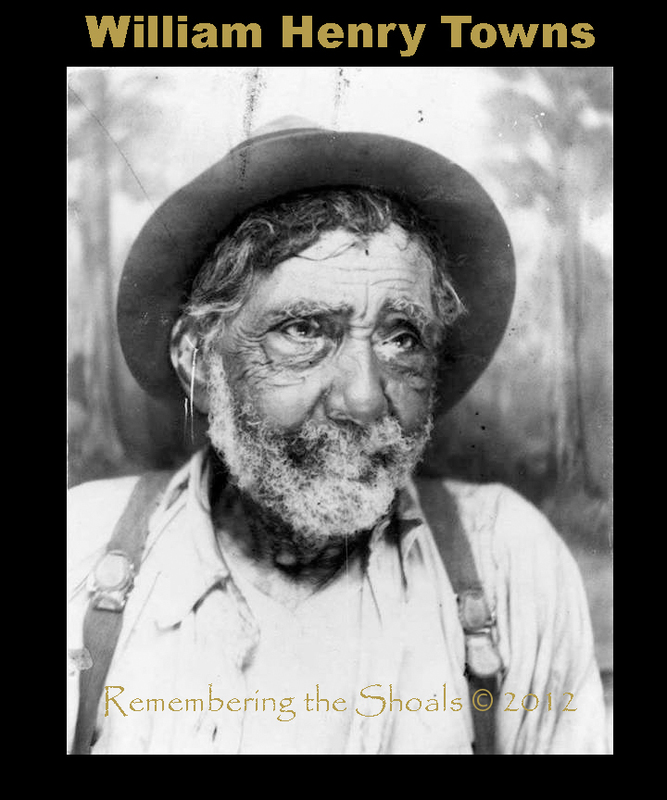 After a short time he moved to Tuscumbia, Alabama, and entered into the mercantile business with his brother George. They traveled on horseback to Philadelphia and Baltimore where they bought their merchandise, which was hauled in wagons to Tuscumbia. About 1827-28, through unfortunate business ventures, the firm became financially embarrassed and in 1829 closed up its business. In December of that year George Sutherland moved to Texas and settled on the Navidad River at a place now in Jackson County. During the winter of 1829-30 several other related families emigrated to Texas and settled in Austin’s Colony, taking out grants of land and establishing homes under the liberal colonization laws governing Texas. Meanwhile the subject of our sketch remained in Tuscumbia, practicing medicine under the old Thompsonian System. He continued the practice of medicine through the succeeding years of his life, and in the 50’s, when cholera swept through the Southern States, he distinguished himself by discovering a cure for that dread malady, whereby he never lost a case not already in the last stages of the disease. Dr. Sutherland freely passed his great discovery on to other doctors for the relief of suffering humanity. In December, 1835, Dr. Sutherland, Captain William Patton and several others visited Texas with a view to settling on lands which the Mexican government offered as an inducement to settlers to make homes in Texas. Arriving at San Felipe they took the oath of allegiance to the new government. They then proceeded toward San Antonio. Meeting General Sam Houston, then in command of the Texian forces, he advised them against going on to San Antonio, saying that he had ordered all troops to fall back east of the Guadalupe River. 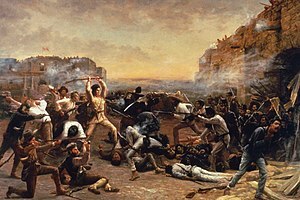 The party however went on to San Antonio, arriving there on the 18th of January, 1836. The accompanying account of the “Fall of the Alamo” by Dr. Sutherland gives his connection with that tragic event in the history of Texas. After the fall of the Alamo, General Houston sent messages by Dr. Sutherland to President David G. Burnet after which President Burnet appointed him one of his aides-de-camp, sending him a written order 1 to facilitate the retirement of the women and children over Groce’s Ferry to the east side of the Brazos River. Having accomplished this mission, Dr. Sutherland returned to Harrisburg, when President Burnet appointed him his private secretary, which position he held until after the battle of San Jacinto and peace was assured. Then he returned to his family in Tuscumbia, Alabama. In the fall of 1837, having closed up his business in Alabama, he brought his family to Texas, reaching the settlement known as Egypt in December. Next year he built a home on the west side of the Colorado River, four miles from Egypt, where he lived until the fall of 1849, when he moved to what is now known as Wilson County, settling near the Sulphur Springs on the Cibolo River. He was the founder and proprietor and first post master of the little town of Sutherland Springs. A lover of education, he encouraged and supported schools in our pioneer State for his own and his neighbor’s children, and when he had provided his children with the best advantages available here, he sent them off to higher institutions of learning. A devout Christian from early manhood, he gave freely of his substance to the building of churches and the support of the ministry. His house was ever the retreat of the wayfarer and the welcoming home of the homeless and needy. He died at his home at Sutherland Springs, April 11, 1867, at the age of seventy-four years and eleven months and is buried in the Sutherland family lot in the Sutherland Springs Cemetery which was a gift from himself to the town. Over his grave and that of his third wife, his surviving children erected a substantial monument. He died as he had lived, a pioneer, a patriot, a Christian gentleman. This sketch of his life is affectionately dedicated to his memory by his grand-daughter. One cannot read about, speak about or visit Sutherland Springs, Texas without running into the name of Dr. John Sutherland. The Sutherland’s ancestry can be linked to castle Dunrobin in the northern most county of Scotland. Very fitting is the Sutherland clan’s motto “Sans Peur” or “without fear.” John was born to a Revolutionary war captain in 1792 in Danville, Virginia. In 1805 the Sutherland family was on the move to Tenessee where John’s father worked on a ferry on the Clinch River. John entered the working life of a store clerk, working his way up very quickly. In 1816 he married Diane Kennedy and moved to Decatur, Alabama. By 1824 he was the president of a bank. The bank failed miserably and in 1826 John and his family moved to Tuscumbia, Alabama to form a partnership in a small merchantile with his brother George. Again John’s business failed, feeling a little beat, George left Alabama and joined Austin’s Colony with an eye to homestead for the both of them. John stayed in Tuscumbia. In 1827, John’s wife Diane passed away. John was left alone. Determined to take care of his aging father and daughter, he began attending medical school. He had a facination with treating disease with steam and local herbs. John married Ann Bryant Lane, opened a practice in Tuscumbia and was doing well for his family, but Texas called to him. He was again on the move on December 12, 1835. He swore allegiance to Texas and became a citizen. He was joined by his brother George’s son William and headed off to the Alamo to help the sick. While out riding he was injured and could not fight, so Col. Travis sent him to bring help, but he returned too late. Lying among the dead was his nephew William De Trest Sutherland. After the Revolution, John settled in Egypt. Then, his second wife died in 1840. In the mid 1840’s John married his third wife Ann Dickson and in 1849, they moved into present day Sutherland Springs. John immediately recognized the powers of the springs and set up shop. Though he did not attain great wealth he did establish the postal service of Sutherland Springs, (coincidentally the longest continuously running post office in Texas). He became Postmaster, Justice of the Peace and opened the first school and platted the townsite, all the while practicing medicine. her large guy with a really big arm came up behind me in line–a pickup truck pulled up right behind where we were standing and about that time as the old saying goes, “All hell broke loose”–the windows were shattering out of Sparkey’s and when I turned around this big fellows arm was about blown off. My first thought, “Snipers” are shooting from the woods across the street and I dived into my auto while my husband was starring in disbelief as he had just recovered from a heart attack. I reached to feel what was wet running down my back and exclaimed, “_ _ _ _”. Oh, ‘I’m shot” Since my husband was about to have yet another heart attack, I drove him home and went to the ER. Does anyone remember Dr. Anderson from Russellville–he happened to be coming through he ER and took care of me–when I arrived Judge Pride Tompkins was there and when I asked him why he was there he said he heard on the radio I had been shot and came to check on me. Can you spell Embarrassment–when Dr. Anderson had the shotgun pellets removed from my back I went back to work hoping no-one else ever heard about this–even my husband would not have believed it if he hadn’t been there. The guy standing behind me was not so lucky, his arm had so many shotgun pellets, they had to leave some on them in and he probably still has them in his arm and as fate would have it, all those would have wound up in the center of my backbone except for the guy who showed up behind me. The incident happened when young twins were exploring their Dad’s gun in the truck; he had left them in the vehicle while he placed his order. Anyway, that’s the story, even if it wound up in two sections. document history sometimes. This is a photo of a wreck that involved a DrPepper truck. 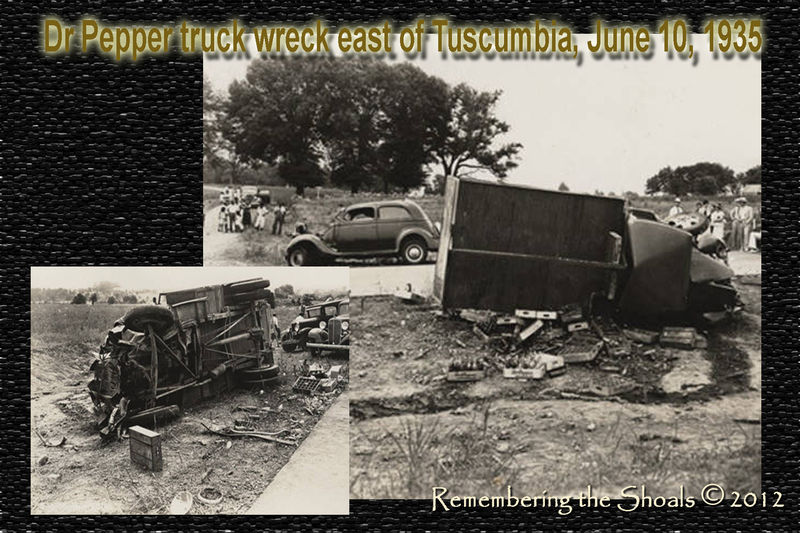 The wreck occurred east of Tuscumbia, Alabama on 10 June 1935. A crowd of onlookers gathered to witness the incident. documents plantation homes in the south. There are photos included of former slaves. The Big House was a two-story house; white like most houses during that time. On the north side of the Big House sat a great big barn, where all the stock and stuff that was raised was kept. Off to the southwest of the barn, west of the BigHouse, set about five or six log houses. — William Henry Towns, former slave describing a plantation near Tuscumbia, Alabama. and they are. Their parents must be very proud of these youth. These seniors from Christian Covenant in Tuscumbia went to the Oak Grove Community and cleaned up some debris caused by the April 27th tornado caravan that swept death and destruction through six or seven states. The Oak Grove Community looks a little nicer now, thanks CC Seniors! was born at LaGrange in Colbert County, Alabama on 21 May 1847. Her parents were Jacob L and Eleanor Luna Landers. She died 10 Jan 1918 in Sheffield, Colbert County, Alabama. She married John David Vandiver Feb 1870. They had seven known children: John Robert Vandiver 1870 – 1960, Mary M Vandiver 1871 – , Matilda Doshie Vandiver 1872 – , Nancy Irene Vandiver 1875 – 1951, James Vandiver 1879 – , and Matthew A Vandiver 1882 – 1917. There are a number of photographs of the John David Vandiver and Eleanor Landers Vandiver family over the years. The photogrph in this article is thought to be that of John David Vandiver’s wife and the mother of his children. 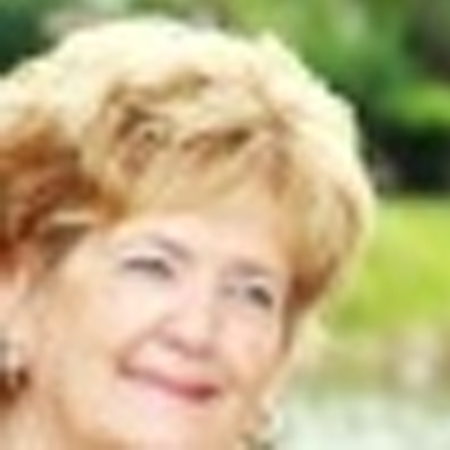 Can anyone verify that this is indeed Elizabeth Eleanor Landers Vandiver? following the War of Northern Aggression could be applied for and submitted to Congress by an individual who had property seized or destroyed by Union Soldiers during the War. The process was long and tedious and required the services of a lawyer. Claim of Sarah A. Goins of Colbert County, Ala. This is the closest thing we have to a photo of Sarah A Downs Goins. Petition of Sarah A. Goins, Colbert County, Ala. Nature of Claim, corn, flour, fodder, bacon and saddle. 1. For the actual use of the army, and not for the mere gratification of individual officers or soldiers already provided by the Government with such articles as were necessary or proper for them to have. 2. In consequence of the failure of the troops of the United States to receive from the Government in the customary manner, or to have in their possession at the time, the articles and supplies necessary for them, for which they were entitled to receive and have. 3. In consequence of some necessity for the articles taken, or similar articles; which necessity justified the officers or soldiers taking them? 4. For some purpose so necessary, useful, beneficial, or justifiable as to warrant or require the Government to pay for it. 5. Under the order or authority of some officer, or other person connected with the army, whose rank, situation, duties, or other circumstances at the time authorized, empowered, or justified him in taking or receiving it, or ordering it to be taken or received. the present owner of the same, (11) that your petitioner remained loyally adherent to the cause and the Government of the United States during the war, and was so loyal before and at the time of the taking of the property for which this claim is made, and she solemnly declares that, from the beginning of hostilities against the United States to the end thereof her sympathies were constantly with the cause of the United States; that she never, of her own free will or accord, did anything or offered, or sought, or attempted to do anything, by word or deed, to injure said cause or retard its success, and that she was at all times ready and willing, when called upon, or if called upon, to aid and assist the cause of the Union, or its supporters, so far as her means and power, and the circumstances of the cause permitted. 5. Describe the organization as fully and particularly as possible. 6. State as well as can be done the place to which the property was conveyed. 7. State as fully and minutely as possible, the particular persons or commands using the property, and to what particular uses it was applied or intended to be applied. 8. If any vouchers or written papers were given, attach the originals or copies, or state where the originals are to be found and give the substance of them. 10. The loyalty of the owner of the property when taken or furnished, and of all persons having a present beneficial interest in the claim, must be established by proof. 11. If any other persons than the original owner now own or have an interest in the claim, state how such ownership or interest was acquired. The said claim has never before been presented to (12) any Department of the Government. That Thos. C. & Fullerton, of Washington, D.C., are hereby authorized and empowered to act as Attorney’s for the prosecution of this claim. Wherefore your petitioner pray for such action of your Honorable Commission in the premises as may be deemed just and proper. Confederate government, or to any officer, department or adherent of the same in support thereof, and that he never voluntarily accepted or exercised the functions of any office whatsoever under, or yielded voluntary support to, the said Confederate Government. Sworn and subscribed in my presence, the 15th day of Jan’y 1873. Post office address of claimant: Sarah A. Goins, Tuscumbia, Ala.
Post office address of attorney: Tuscumbia, Ala.
12. If the claim has heretofore been presented to any branch of the Government, state when and where presented, and what action was taken upon it. 14. Give the names of all the petitioners. 15. If more than one petitioner, insert the words, “each for himself”, and in the next line insert, “one of” in the proper blanks. 18. After 1st October, 1872, no Internal Revenue stamps required. Filed by: Lewis & Fullerton, Attorney-At-Law, Washington, D.C.
1. Insert number of, the claim, if known. 3. Describe the military organization by name as fully and particularly as possible. 4. State as well as can be done, the place to which the property was conveyed for the use of the army. 5. State as fully and minutely as possible, the particular persons or commands using the property, and to what particular use it was applied. 6. The claimant’s name should be signed here, either by himself of his attorney. recorded, at such place and at such time as the Special Commissioner may designate at the proper cost of the said Claimant; and that due notice of the time and place of the taking thereof be given to the Claimant, through his council. Directions: This certificate, with accompanying printed questions, goes in front of the depositions. A single sheet, marked “Last Page,” accompanies this double sheet, and goes at the end of the depositions, having on its outside a printed form of endorsement to be filled up by the special Commissioner. Before the Commissioners of Claims. Each and every deponent, previous to his or her examination, was properly and duly sworn, or affirmed to tell the truth, the whole truth, and nothing but the truth concerning the matters under examination; the claimant’s witnesses were examined separately and apart from each other; the testimony of each deponent was written out by me in presence of such deponent, who signed the same in my presence after having the deposition read aloud to each deponent, and the signature of such deponent was by me attested at the time it was affixed to the deposition. Witness my hand and seal this 28th day of July, 1875. The following questions will be put to every person who gives testimony. 1. What is your name, your age, your residence and how long has it been such, and your occupation? 2. If you are not the claimant, it what manner, if any, are you related to the claimant or interested in the success of the claim? 3. Where were you born? If not born in the United States, when and where were you naturalized? Produce your naturalization papers if you can. 4. Where were you residing and what was your business for six months before the outbreak of the rebellion, and where did you reside and what was your business from the beginning to the end of the war? And if you changed your residence or business, state how many times, and why such changes were made. 5. On which side were your sympathies during the war, and were they on the same side from beginning to end? 6. Did you ever do anything or say anything against the Union cause: and if so, what did you say, and why? 7. Were you at all times during the war willing and ready to do whatever you could in aid of the Union cause? 8. Did you ever do anything for the Union cause, or its advocates or defenders? If so, state what you did, giving times, places, names of persons aided, and particulars. Were the person aided your relatives? 9. Had you any near relatives in the Union army or navy? If so, in what company and regiment, or on what vessel, when and where did each one enter service, and when and how did he leave service? If he was a son, produce his discharge paper, in order that its contents may be noted in this deposition, or state why it cannot be produced. 10. Were you in the service or employment of the United States Government at any time during the war? If so, in what service, when, where, for how long, under what officers, and when and how long did you leave such service of employment? 11. Did you ever voluntarily contribute money, property, or services to the Union cause; and if so, when, where, to whom, and what did you contribute? 12. Which side did you take while the insurgent States were seceding from the Union in 1860 and 1861, and what did you do to show on which side you stood? 13. Did you adhere to the Union cause after the States has passed into rebellion, or did you go with your state? 14. What were your feelings covering the battle of Bull Run or Manassas, the capture of New Orleans, the fall of Vicksburg, and the final surrender of the Confederate forces? 15. What favors, privileges, or protections were ever granted you in recognition of your loyalty during the war, and when and by whom granted? 16. Have you ever taken the so-called “iron-clad oath” since the war, and when on what occasions? 17. Who were the leading and best known Unionists of your vicinity during the war? Are any of them called to testify to your loyalty; and if not, why not? 18. Were you ever threatened with damage or injury to your person, family, or property on account of your Union sentiments, or were you actually molested or injured on account of your Union sentiments? If so, when, where, by whom, and in what particular way were you injured or threatened with injury? 19. Were you ever arrested by and Confederate officer, soldier, sailor, or other person professing to act for the Confederate government, or for any State in rebellion? If so, when, where, by whom, for what cause: how long were you kept under arrest: how did you obtain your release: did you take any oath or give any bond to effect your release: and if so, what was the nature of the oath or the bond? 20. Was any of your property taken by Confederate officers or soldiers, or any rebel authority: If so, what property, when, where, by whom, were you ever paid therefore, and did you ever present an account therefore to the Confederate government, or any rebel officer? 21. Was any of your property ever confiscated by rebel authority, on the ground that you were an enemy to the rebel cause? If so, give all the particulars and state if the property was subsequently released or compensation made therefore. 22. Did you ever do anything for the Confederate cause, or provide any aid or comfort to the rebellion? If so, give the times, places, persons, and other particulars connected with each transaction. 23. What force, compulsion, or influence was used to make you do anything against the Union cause? If any, give all the particulars demanded in the last question. 24. Were you in any service, business, or employment, for the Confederacy, or for any rebel authority? If so, give the same particulars as before required. 25. Were you in the civil, military, or naval service of the Confederacy, or any rebel State, in any capacity whatsoever: If so, state fully in respect to each occasion and service. 26. Did you ever take any oath to the so-called Confederate States while in any rebel service or employment? 27. Did you ever have charge of any stores, or other property, for the Confederacy; or did you ever sell or furnish any supplies to the so-called Confederate States in rebellion; or did you have any share or interest in contracts or manufacturers in aid of the rebellion? 28. Were you engaged in blockade running, or running through the lines, or interested in the risks or profits of ventures? 29. Were you in any way interested in any vessel navigating the waters of the Confederacy, or entering or leaving any Confederate port? If so, what vessel, when and where employed, in what business, and had any rebel authority any direct or indirect interest in vessel or cargo? 30. Did you ever subscribe to any loan of the Confederate States, or of any rebel State: or own Confederate bonds or securities, or the bonds or securities of any rebel State issued between 1861 and 1865? Did you sell, or agree to sell, cotton or produce to the Confederate Government, or to any rebel State, or to any rebel officer or agent, and if so, did you receive or agree to receive Confederate or State bonds or securities in payment: and if so, to what amount, and for what kind and amount of property? 31. Did you contribute to the raising, equipment or support of troops, or the building of gunboats, in aid of the rebellion: or to military hospitals or invalids, or to relief funds or subscriptions for the families of persons serving against the United States? 32. Did you ever give any information to any person in aid of military or naval operations against the United States? 33. Were you at any time a member of any society or organization for equipping volunteers or conscripts, or for aiding the rebellion cause in any way? 34. Did you ever take on oath of allegiance to the so-called Confederate States? If so, state how often, when, where, for what purpose, and the nature of the oath or affirmation. 35. Did you ever receive a pass from rebel authority? If so, state when, where, for what purpose, on what conditions, and how the pass was used. 36. Had you any near relatives in the Confederate army, or in any military or naval services hostile to the United States? If so, give names, ages on entering service, present residence, if living, what influence you exerted, if any, against their entering the service, and in what way you contributed to their outfit or support. 37. Have you ever been under the disabilities imposed by the fourteenth amendment to the Constitution? Have your disabilities been removed by Congress? 38. Have you been specially pardoned by the President for participation in the rebellion? 39. Did you take any amnesty oath during the war, or after its close? If so, when, where, and why did you take it? 40. Were you ever a prisoner of the United States authorities, or on parole, or under bonds to do nothing against the Union cause? If so, state all the particulars. 41. Were you ever arrested by the authorities of the United States during the war? If so, when, where, by whom, on what grounds, and when and how did you obtain your release? 42. Were any fines or assessments levied upon you by the authorities of the United States because of your supposed sympathy for the rebellion? If so, state all the facts. relating to confiscation, or to captured and abandoned property? 44. After the Presidential election of 1860, if of age, did you vote for any candidates, or on any questions, during the war and how did you vote? Did you vote for or against candidates favoring secession? Did you vote for or against the ratification of the ordinances of secession, or for or against separation in your state? 45. Did you belong to any vigilance committee, or committee of safety, homeguard, or any other form of organization or combination designed to suppress Union sentiment in your vicinity? 46. Were you in the Confederate army, State militia, or any military or naval organization hostile to the United States? If so, state when, where, in what organization, how and why you entered, how long you remained each time, and when and how you left. If you claim that you were conscripted, when and where was it, how did you receive notice, and from whom, and what was the precise manner in which the conscription was enforced against you. If you were never in the rebel army or other hostile organization, explain how you escaped service. If you furnished a substitute, when and why did you furnish one, and what is his name, and his present address, if living? 47. Were you in any way connected with or employed in the Confederate quartermaster, commissary, ordnance, engineer, or medical department, or any other department, or employed on any railroad transporting troops or supplies for the Confederacy or otherwise engaged in transportation of men and supplies for the Confederacy: If so, state how employed, when, where, for how long, under whose direction, and why such employment was not giving “aid and comfort” to the rebellion. 48. Did you at any time have charge of trains, teams, wagons, vessels, boats, or military supplies or property of any kind for the Confederate government? If so, give all the facts as in previous questions. 49. Were you employed in saltpeter works, in tanning or milling for the Confederate government, or making clothing, boots, shoes, saddles, harness, arms, ammunition, accoutrements, or any other kind of munitions of war for the Confederacy? If so, give all the particulars of time, place, and nature of service or supplies. 50. Were you ever engaged in holding in custody, directly or indirectly, any person taken by the rebel government as prisoners of war, or any persons imprisoned or confined by the confederate government, or the authorities of any rebel State, for political causes? If so, when, where, under what circumstances, in what capacity were you engaged, and what was the name and rank of your principal? 51. Were you ever in the Union army or navy, or in any service connected therewith? If so, when, where, in what capacity, under whose command or authority, for what period of time, and when and how did you leave service? Produce your discharge papers, so that their contents may be noted herein. 52. In whose favor are you here to testify? 53. How long have you known that person altogether, and what part of that time have you intimately known him? 54. Did you live near him during the war, and how far away? 55. Did you meet him often, and about how often, during the war? 56. Did you converse with the claimant about the war, its causes, its progress, and its results? If so, try to remember the more important occasions on which you so conversed, beginning with the first occasion, and state, with respect to each, when it was, where it was, who were present, what caused the conversation, and what the claimant said in substance, if you cannot remember the words. 57. Do you know anything done by this claimant that showed him to be loyal to the Union during the cause during the war? If you do, state what he did, when, where, and what was the particular cause or occasion of his doing it? Give the same information about each thing he did that showed him to be loyal. 58. Do you know of anything said or done by the claimant that was against the Union cause? If so, please state with respect to each thing said or done, what it was, when it was, where it was, and what particular compulsion or influence caused him to say or do it. 59. If you have heard of anything said or done by the claimant, either for the Union cause or against it, state from whom you heard it, when you heard it, and what you heard. 60. What was the public reputation of the claimant for loyalty or disloyalty to the United States during the war? If you profess to know his public reputation, explain fully how you know it, whom you heard speak of it, and give the names of other persons who were neighbors during the war that could testify to his public reputation. 61. Who were the known and prominent Union people of the neighborhood during the war, and do you know that such persons could testify to the claimant’s loyalty? 62. Were you, yourself, and adherent of the Union cause during the war? If so, did the claimant know you to be such, and how did he know it? 63. Do you know of any threats, molestations, or injury inflicted upon the claimant, or his family, or his property, on account of his adherence to the Union cause? If so, give the particulars. 64. Do you know of any act done or language used by the claimant that would have prevented him from establishing his loyalty to the Confederacy? If so, what act, or what language. 65. Can you state any other facts within your own knowledge in proof of the claimant’s loyalty during the war? If so, state all the facts add give the particulars. 66. Who was the owner of the property charged in this claim when it was taken, and how did such person become owner? 67. If any of the property was taken from a farm or plantation, where was such farm or plantation situated, what was its size, how much was cultivated, how much was woodland, and how much was waste land? 68. Has the person who owned the property when taken since filed a petition in bankruptcy, or been declared a bankrupt? 69. Are you married or single? If married, when were you married? Was your husband loyal to the cause and Government of the United States throughout the war? Where does he now reside, and why is he not joined with you in the petition? How many children have you? Give their names and ages. Were any of them in the Confederate service during the war? If you claim that the property named in your petition is your sole and separate property state how you came to own it separately from your husband: how your title was derived: when your ownership of it began. Did it ever belong to your husband? If the property for which you ask pay is wool, timber, rails, or the products of a farm, how did you get title to the farm? If by deed, can you file copies of the deed? If single, have you been married? If a widow, when did your husband die? Was he in the Confederate army? Was he in the civil service of the confederacy? Was he loyal to the United States Government throughout the war? Did he leave any children? How many? Are any now living? Give their names and ages. Are they not interested in this claim? If they are not joined in this petition, why not? State fully how your title to the property specified in the petition was obtained. Did you ever belong to any sewing society organized to make clothing for Confederate soldiers or their families, or did you assist in making any such clothing, or making flags or other military equipments, or preparing or furnishing delicacies or supplies for Confederate hospitals or soldiers? 70. Were you a slave or free at the beginning of the war? If ever a slave, when did you become free? What business did you follow after obtaining your freedom? Did you own this property before or after you became free? When did you get it? How did you become the owner, and from whom did you obtain it? Where did you get the means to pay for it? What was the name and residence of your master, and is he still living? Is he a witness for you, and if not, why not? Are you in his employ now, or do you live on his land bought from him? Are you in his debt? What other person besides yourself has any interest in this claim? 71.Were you formerly the slave of the claimant? Are you now in his service or employment? Do you live on his land? Are you in his debt? Are you in any way to share in this claim if allowed? 72. Were you present when any of the property charged in this claim was taken? Did you actually see if taken? If. so, specify what you saw taken. 73. Was any of the property taken in the night time, or was any taken secretly, so that you did not know of it at the time? 74. Was any complaint made to any officer of the taking of any of the property? If so, give the name, rank, and regiment of the officer, and state who made the complaint to him, what he said and did in consequence, and what was the result of the complaint? 75. Were any vouchers or receipts asked for or given? If given, where are the vouchers or receipts? If lost, state fully how lost. If asked and not given, by whom were they asked, who was asked to give them, and why were they refused or not given? State very fully in regard to the failure to ask or obtain receipts. 76. Has any payment ever been made for any property charged in this claim? Has any payment been made for any property taken at the same times as the property charged in this claim? Has any payment been made for any property taken from the same claimant during the war, and if so, when, by whom, for what property and to what amount? Has this property, or any part of it, been included in any claim heretofore presented to Congress, or any court, department or officer of the United States, or to any board of survey, military commission, State commission or officer, or any other authority? If so, when and to what tribunal or officers was the claim presented; was it larger or smaller in amount than this claim and how is the difference explained, and what was the decision, if any, of the tribunal to which it was presented. 77. Was the property charged in this claim taken by troops encamped in the vicinity, or were they on the march, or were they on a raid or expedition, or had there been any resent battle or skirmish? 78. You will please listen attentively while the list of items, but not quantities is read to you, and as each kind of property is called off, say whether you saw any such property taken. 79. Begin now with the first item of property you have just said you saw taken, and give the following information about it. 1st. Describe its exact condition, as, for instance, if corn, whether green or ripe, standing or harvested, in shuck, or husked, or shelled; if lumber, whether new or old, in buildings or piled; if grain, whether growing or cut, &e., &e.
2d. State where it was. 3d. what was the quantity; explain fully how you know the quantity, and if estimated, describe your method of making the estimate. 4th. Describe the quality to your best judgment. 5th. State as nearly as you can the market value of such property at the time in United States money. 6th. Say when the property was taken. 7th. Give the name of the detachment, regiment, brigade, division, corps, or army, taking the property, and the names of any officers belonging to the command. 8th. Describe the precise manner in which the property was taken into possession by the troops, and the manner in which it was removed. were occupied, and to what place they removed the property. 10th. State if any officers were present; how you knew them to be officers; what they said or did in relation to the property, and give the names of any, if you can. 11th. Give any reasons that you may have for believing that the taking of the property was authorized by the proper officers or that it was for the necessary use of the army. 80. Now take the next item of the property you saw taken and give the same information, and so proceed to the end of the list of items. To the 1st—My name is Sarah A. Goins. My age is 62 years—my residence is in Colbert County, Alabama and has been such for about 12 years past. My occupation is that of attending to my household affairs. To the 2nd—I am the claimant. To the 3rd—I was born in the state of South Carolina. changed my residence or business, the county of Colbert being a part of Franklin previous to and during the war. To the 5th—My sympathies were on the side of the Union from the beginning to the ending of the war, and are still unchanged. To the 8th—I was not in a condition to do anything. I being a widow and having charge of a family. I did all I could to feed Union families, soldiers, and those who sympathized with the cause. One of my sons, a minor, went off with the Federal army and was afterwards taken prisoner by the Confederates and carried to Jackson, Mississippi. I have never heard of him since. what Company or Regiment my said son in law went. (into was crossed out) He died soon after. I have never heard of my son since I learned he was captured and carried to Jackson, Mississippi as before stated, and cannot produce his discharge papers, as I never saw it, if ever given. To the 12th—I took the Union side, I exercised? my attachment to the Union, by talking in its favor, Could do nothing else being a woman. To the 13th—I did adhere to the Union cause and did not go with the State. To the 14th—I was rejoiced in the all successes of the Union cause and sorry when it met with reverses. I still rejoice over the final overthrow of the Confederacy, and its forces. To the 15th—None, further than that the Union soldiers when at my house, treated me as such. To the 16th—I have not. To the 17th—William Goin, Washington Goin and Wilkenson Bowen, and William Skinner. The two first named are to be witnesses to prove my loyalty. To the 18th and 19th—She answers no. To the 20th—She says. I had small quantities of corn taken from me frequently by Roddy’s Confederate Calvary. Cannot state the dates. I have never been paid for any of it. I never presented any account for it to any government or officer. To the 21st and 22nd—She says no. To the 23rd—She says none. To the 24th, 25th, 26th, 27th, 28th, 29th, 30th, 31st, 32nd, 33rd, 34th, 35th—She says no. To the 36th—She says one son, viz, James M. Goin, and two nephews, Alfred and Monroe Goin were conscripted into the Confederate service. They, I think were then under 21 years of age, my said son lives now in Franklin and my said nephews in Colbert County, Alabama. They were conscripted against my will as well as their own. I contributed nothing to their outfit or support while in said service or for ___? them for it. To the 37th, 38th, 39th, 40th, 41st, 42nd, 43rd—She says no. To the 66th—She says I was the owner of the property charged for in my claim when it was taken. It was made by the labor of myself and female children under my control. To the 67th—The property was taken from my farm on which I resided and on which I still reside. It lies on Colbert County, Alabama. Its size is about 80 acres, about from 10 to 15 acres was cultivated, the balance was woodland. To the 68th—She says no. To the 69th—I am single, I am a widow, my husband died in 1862. He was loyal to the Union cause. I have 7 children living, viz. Elizabeth Sparks, aged 45 years, Nancy A. King about 35 years old, Adaline Kimbrough, about 33 years old, Emily King about 30 years old, James M. Goin about 26 or 27 years old, Josephine Grisham, about 24 years old, and Frances Bolton aged about 21 years. Morgan M. Goin, another son, who went into the Federal army, was about 19 years when he went into the army. Do not know whether he is living or not. James M. Goin, as before stated was conscripted into the Confederate army. The land on which I reside was bought and paid for by me since my husband’s death. It never belonged to my husband. I bought the farm myself since my husband’s death. My husband died in 1862. He was not in the Confederate army, neither was he in its civil service. He was loyal to the Union while he lived. He left the children before mentioned. They are not interested in their claim. I have stated that the property embraced in my claim, was raised by the labor of myself and the female children under my control. I belonged to no sewing society organized to make clothing for Confederate soldiers or their families, nor did I assist in doing any of the thing specified in connection therewith & en___? Of. To the 72nd—She says I was present when the property charged for in my claim was taken. I saw the corn, fodder, flour, bacon and saddle set out in my claim taken. To the 73rd—She says. None of the property was taken in the night time or secretly. It was taken in my presence. To the 74th—She says. I only begged them not to take all I had, but to leave me a part. I think a Lieutenant was present judging from his uniform. I do not know his name, rank, or regiment. He and the soldiers taking belonged to that portion of the United States Army commanded by General Wilson. They went on to taking the property as though I had not complained. To the 75th—She says. No voucher or receipt was asked for or given. To the 76th—She says. No payment has been made for the property charged in this claim. Nor for any taken at the same time, nor for any property taken from me during the war. None on the property in this claim has been included in any claim heretofore presented to Congress, or any court, department or officer of any other authority. To the 77th—She says. The property was taken by United States soldiers belonging to the army commanded by General Wilson, while on their march south through Franklin County, Alabama. No recent battle or skirmish had taken place near there. To the 78th—She says. I saw the corn, fodder, flour, bacon and saddle taken. To the 79th—She says. The corn, item No. 1, was taken from the crib, in was in the shuck, and dry & sound. I estimate the quantity taken at 50 bushels, I am sure not less was taken. I judged by the determination of the bulk on hand, by the taking. It was of good quality, It was then & there worth 1 $ per bushel. The fodder, item No. 2 was taken from the stable left where it was stoned. It was well cured and sound. Three hundred bundles of 2 lbs weight each was taken. It was then & there worth 2 $ per 100 pounds. The flour, item No. 3, was of good quality. I had just received 100 pounds, and know over half of it was taken, know by what was left. It was then worth about 8 cents per pound. The bacon, item No. 4, was taken from the smoke house. It was well cured, sound & dry. It was side hams and shoulders. All was taken but one jowl. I feel sure that at least 100 lbs was taken. I only estimate the quantity. It was then & there worth 25 cents per pound. The saddle, item No. 5, was a new man’s saddle of good quality, it was then & there worth 15 $. All of this property was taken at the residence of claimant in Franklin now Colbert County, Alabama, on, or about the last of March or first of April 1865, by that portion of the United States army commanded by Maj. General J.H. Wilson, while on its move south, I cannot otherwise describe the army. I do not know the names of the officers in command of it except as stated. The property was carried off by soldiers on horses. The soldiers came in squads of from 6 to 12 and took & carried off the property on their horses, one squad succeed another until all was taken. It was all taken in the course of one hour, between from 3 to 4o’clock pm. It was carried off in the direction in which the main army was moving. I saw one officer that I took to be a Lieutenant, by his uniform, present. I heard him say nothing about the taking of the property. I do not know his name. My reason for believing that the property was taken for the use of the army and was needed by it, is, that the soldiers in squads took it, th? are officers were present, that the property was of that kind needed by armies, that it was carried in the direction of service body of the troops, and that such property was generally taken from citizens living on the line of the march of said army, and consumed by its soldiers & stock. And further defendant saith not. To the several standing interrogatories propounded? to witness. He answers and says. To the 1st interrogatory he says. My name is Washington J. Goin. I reside in Colbert County, Alabama, have resided there about 19 years. My occupation has been that of a farmer. To the 2nd int. he answers—The claimant is a sister in law of mine. I am in no wise interested in the success of the claimant’s claim. To the 52nd interrogatory he says. I am here to testify in favor of claimant. To the 53rd interrogatory he says. Have known the claimant 45 years and intimately all that time. To the 54th interrogatory he says. I lived with 3/8ths of a mile of claimant during the war. To the 55th interrogatory he says. I met claimant almost daily during the war. To the 56th interrogatory he says. I conversed with claimant very often during the war, (cannot say how often) about the war, its progress, and results. Cannot state the particular dates, but know it was almost daily. I cannot state who was present, nor can I state what caused the conversation, further than that the war was a general topic of conversation, I recollect that I heard her say when General Buell’s command arrived at Tuscumbia, Alabama, “that we had better all go north, that we would be in a better condition” she expressed herself strongly in the favor of the Union at all times during the war and never otherwise so far as I know. To the 57th interrogatory he says. Nothing further than before stated, she always declared herself to be in favor of the Union. To the 58th interrogatory he says. I never did. To the 59th interrogatory he says. I only heard from claimant that she was in favor of the Union cause. I never heard anything to the contrary, from any person. To the 60th interrogatory he says. Claimant’s reputation for loyalty to the Union and it’s cause, during the war was always good. I know this because her Union neighbors so spoke of her, I think I have heard Julius Rogers, Leroy Mitchell, and other Union men speak of her loyalty to the Union, and think they would testify to her loyalty. To the 61st interrogatory he says. Josiah Dillard, Julius Rodgers, and Leroy Mitchell, were prominent people of the neighborhood during war. I know they could testify claimant’s loyalty. To the 62nd interrogatory he says. I, was, myself an adherent of the cause during the war, and claimant knew me to be such, by above to that effect often made. To the 63rd interrogatory he says. None that I recollect. To the 64th interrogatory he says. I have never, at any time, been cognizant of any act, or declaration made by claimant, that would have enabled her to establish her loyalty to the Confederacy, but have often heard her make declarations, that would have prevented the establishment of her loyalty thereto. She always declared herself to be in favor of the Union __? cause & against the Confederacy. To the 65th interrogatory he says. I have stated all I know. And further deponent saith not. To the 1st interrogatory he says. My name is William Goin. I am 69 years old. I reside in Colbert County, Alabama, and have forth last 20 years. I am a farmer. To the 2nd interrogatory he says. I am a brother in law of the claimant. I am in no wise interested in the success of her claim. To the 53rdinterrogatory he says. I have known the claimant 50 years. All that time intimately. To the 54thinterrogatory he says. I lived with about 1-1/4 miles of claimant during the war. To the 55th interrogatory he says. I met claimant often during the war. Cannot say how often. I think as often as once or twice a month. To the56th interrogatory he says. I conversed with claimant very often during the war, about the war, its causes, its progress and its results, but I cannot recollect the particular date, nor who was present, except Charles Womble?, Elbert Claunch, & Richard Holley were present on one occasion. She then and at all other times declared herself to be in favor the Union & its cause. I never knew to express any sentiment otherwise, cannot remember her exact words. To the 57th interrogatory he says. Nothing further than before stated. To the 58th interrogatory he says. None. To the 59th interrogatory he says. I never heard anything stated by claimant against the Union cause, nor have I heard from others that she had ever said anything against said cause. To the 60th interrogatory he says. The public reputation of claimant for loyalty to the United States was good during the war. I know her reputation during the war from her declaration, from which other Union citizens said about her. I think Robert Mitchell, William Gresham, Leroy Mitchell, & other Union men, in the neighborhood could testify to her loyalty as well as public reputation in that respect. To the 61st interrogatory he says. Leroy & Robert Mitchell, Richard Holley, Green Jackson, & Marcus Cheatham were prominent Union men of the neighborhood during the war. I have not doubt but they could testify to claimant’s loyalty. To the 62nd interrogatory he says. I was, myself, an adherent of the Union cause during the war, and I was so known to the claimant by oft reputed declarations to that effect. To the 63rd interrogatory he says. None. To the 64th interrogatory he says. I know that if the declaration of claimant to the effect that she was in favor of the Union & its cause and was opposed to secession and the Confederacy, would be sufficient, she could not have established her loyalty to the Confederacy if it have been overturned. To the 65th interrogatory he says. I know nothing further than I have before stated and further deponent saith not. In answer to the 1st standing interrogatory, deponent says. My name is William C. Grissom, my age is 31 years. My residence is in Colbert County, Alabama, and has been for 20 years past. I am a farmer. The answer to the 2nd standing interrogatory, he says. I am nor related to the claimant, I am not interested in the success of her claim. The answer to the 72nd standing interrogatory, he says. I was present when the property charged for was taken, I saw the corn, fodder, flour, bacon and saddle taken. The answer to the 73rd standing interrogatory, he says. The property was taken in the day time, not secretly, but in my presence. The answer to the 74th standing interrogatory, he says. None that I heard, except that claimant tried to get as much as possible spared to her. Officers were present, but I do not know their names, rank or regiment. Heard none of them make any reply-but the property was taken. Answer to the 75th standing interrogatory, he says. None that I know of. Answer to the 76th standing interrogatory, he says. I know nothing of the matters required of this interrogatory. Answer to the 77th standing interrogatory, he says. The property was taken by troops while on their march, on an expedition or said Southward, there have been no recent battle or skirmish near there. Answer to the 78th standing interrogatory, he says. I saw the corn, item No. 1. The fodder, item No. 2, the flour item No. 3. The bacon, item No. 4, and the saddle, item No. 5, taken. Answer to the 79th standing interrogatory, he says. The corn, item No. 1 was taken from the crib, it was mostly in the shuck, dry and good quality. It was taken at claimant’s residence in then now Franklin, now Colbert County, Alabama, I do not know the actual quantity taken, but judging from the diminution of the bulk by the taking, I feel sure that as much as 50 bushels was taken. It was then & there were worth fully 1 $ per bushel. The fodder, item No. 2 was taken from the left of the stable, it was well cured and dry. Cannot give exact quantity taken, but feel safe in saying that at least 600 lbs was taken, if not more. It was then & there worth 2 cents per pound. The flour, item No. 3 was of good quality, cannot give actual quantity taken, but think fully as much as 50 lbs was taken. It was then & there worth 5 cents per pound. The bacon, item No. 4 was taken from the smoke house, it was well cured, sound, and dry. Do not know exact quantity taken, but am certain at least 100 lbs was taken, it was then & there worth 25 cents per pound. The saddle, item No. 5, was a man’s saddle, new and of good quality. It was worth then & there at least 15 $. All of this property was taken by soldiers, under the command of officers, belonging that portion of the United States army commanded by Genl J.H. Wilson, while on their march south, about the 23rd or 24th March 1865, at the residence of claimant in then Franklin, now Colbert County, Alabama. I cannot otherwise describe the army taking, nor can I give the names of the officers belonging to said command. The property was taken possession of by soldiers on squads of 6 to 20 at a time. It was removed on horses by soldiers. Cannot state the number of soldiers engaged in taking and removing as they came at different times & in squads varying from 6 to 20 men. They were engaged in taking about 1 hour or more. The property moved in the direction of the main army, then on its march along the road. I saw officers present, judging by their uniforms, but I do not know their names or rank. I heard none of them speak on the subject of taking the property. I think the property was taken for the use of such army because it was the kind of property it needed on a raid, because it was carried off toward the army & because officers were present when it was taken, and apparently sanctioned the taking. And further deponent saith not. 1st Interrogatory. My name is James M. Goin, I am 25 years of old, I reside in Franklin County, state of Alabama, have resided in said county about 15 months past. Resided before Colbert County, Alabama, for about 15 years, embracing the period of the war. I am a farmer. To the 2nd Interrogatory. I am a son of the claimant, but have no pecuniary interest in the success of her claim. To the 72nd interrogatory. I was present when said property was taken. I saw it taken. I saw the corn item, No. 1-the fodder item No. 2. The flour item No. 3, the bacon item No. 4 and the saddle, item No. 5 taken. To the 73rd Interrogatory. All was taken in the day time, publically. To the 74th Interrogatory. I do not recollect any. To the 75th Interrogatory. None that I know of. To the 76th Interrogatory. I know nothing of the matter here original of. To the 77th Interrogatory. The army was on its march when the property was taken, there had been no recent battle or skirmish near. To the 78th Interrogatory. I saw corn, fodder, flour, bacon, and the saddle taken. To the 79th Interrogatory. The corn, item No 1., was taken from the crib, part was taken in the shuck, and part was husked, say about half of each. It was sound & dry and of good quality, I estimate the quantity taken at not less than 50 bushel, I had before hauled it up and put it in the crib, and judge the quantity by the diminished bulk, caused by the taking, it was then & there worth 1 $ per bushel. The fodder, item No. 2 was taken from the stable loft, 300 bundles that would weigh 2 lbs each, on a average, that were taken. The fodder was well cured and dry, and was then & there worth 1-1/2 cents per pound. The flour, item No. 3, was a good article, half of a 100 lb sack was taken. It was then & there worth 8 cents per pound. The bacon, item No. 4 was well cured and sound. It was taken from the smoke house, at least 100 lbs was taken, I know this because all on hand except one piece was taken, and there could have not been less. It was then & there worth 25 cents per pound. The saddle, item No. 5 was new, it was a citizen’s saddle, of fair quality, with quilted seat, it was then & there worth 18 $. All of said property was taken from claimant at her residence, in then, Franklin (now Colbert) county, state of Alabama, in the latter part of March 1865, by soldiers belonging to that portion of the United States army commanded by General J.H. Wilson while said army was on its march south through said county. I only know the army as General Wilson’s command-cannot otherwise describe it. I do not know the names of the officers in command, or belonging to said army further than I have stated. The property was carried off by soldiers on horses, squads of from 12 to 50 soldiers at intervals took. Officers accompanied them judging by their uniforms. It was all taken in the course of 2 or 3 hours. It was carried in the direction of where the main army was nearing, about half a mile distance. I only know officers were present by their uniforms, do not know their names, heard them say nothing in relation to the property, but them seemed to direct the taking. I believe the property was authorized to be taken, because officer of the army were present, and that the property was needed by the army to which they belonged, for food, provender? and other use, because it was on its march, and every where generally took supplies from the people living near its route, and further deponent saith not. Note. – On this page the special commissioner may enter any explanation, statement, note or comment of his own which may be of service in the examination and decision of the claim at Washington. If there be anything noticeable in the appearance, conduct, or condition of the witness the fact should be noted on this page. If the special commissioner knows or hears anything, apart from what appears in the deposition, that either confirms or impugns the credibility of the testimony or the merit of the claim, he should state what he knows or what he has heard, with the means of knowledge, or the names of his informants, as the case may be, in order that formal inquiry may be made, or further evidence demanded, if necessary. It would be serviceable to both sides if the special commissioner were to ascertain and set down the names of the men, still living, who, by general reputation, were leading Unionists of the war-period in the vicinity of the claimant. Comment or opinion based merely on the testimony taken is not desired. The foregoing depositions of Sarah A. Goin, claimant, and of her witnesses, Washington J. Goin, William Goin, William C. Grissom, and James M. Goin, contained on the fore-going pages from 5-27 inclusive, were taken by me in all respects as stated in my certificate preceding the same on page 1. I know of nothing that would either confirm or impugn the credibility of the testimony, or the merit of the claim, either of my own knowledge or from hearsay. Washington and William Goin are reputed Union men. Given under my hand this 28th day of July 1875. This proof was not sent sooner because the fees due me were not paid earlier. $95.00 Due him Out of the Appropriations for Claims of Loyal Citizens for supplies furnished during the rebellion. Requisition No. 3753, dated April 7, 1877, transmitted for Warrant April 12th, 1877. THE UNITED STATES, to Sarah A. Goins, Ala. Payable to claimant in care of Thomas C. Fullerton, Washington, D.C.
is intertwined with the Holliman, Hand, Hays, Gregory and other collateral lines in Lawrence and then Franklin, but now Colbert County, Alabama. is how Felix Grundy Norman has been described. FELIX G NORMAN, of Franklin [County Alabama], was born and educated in Tennessee. He represented Franklin for the first time at the session of 1841, and by continuous elections, he served in the House until the close of the session of 1847-8, since which time he has been in private life, engaged in the practice of law. While in the Legislature, Col. Norman was a very efficient member, both in debate and in Committees. He was a Democrat from honest conviction, and never departed from that faith, but always kept himself in the path of duty according to the best of his judgment. Acting on principle, he opposed at every step the resolutions of the General Assembly accepting Alabama’s portion of the proceeds of the public lands. In the same manner, he opposed what he considered the improper identity in the same resolution, on the Constitutional amendment providing for biennial sessions of the Legislature, and for the removal of the Seat of Government at the session of 1845. In all this, he only yielded to a sense of duty, to prevent injustice, or an unsafe precedent. However laudable his purpose, he course on the question of removal resulted to his injury, through influences subsequently brought to bear against him, in a political sense. A GRAND MASTER: of the Grand Lodge AF&AM of Alabama 1845 – 1846.
a Presbyterian; and a Mason. 1841, 1842, 1844, 1845 and 1847-8, inclusive. debarred from active participation on account of his age. at Smyrna, Rutherford county, Tenn.
Jane, was born in Huntsville, Ala., Feb. 22, 1824, and died June 25, 1901. He and his wife are buried in the Oakwood Cemetery at Tuscumbia. Mrs.
Cook and Mr. and Mrs. Norman were the parents of several well known children. the path of duty according to the best of his judgment. Assembly accepting Alabama’s portion of the proceeds of the public lands. subsequently brought to bear against him, in a political sense. measure because it may have originated with his opponents. Grand Lodge of Alabama, City of Montgomery. Master:1837-43, 1846-48, 1850-54, 1858, 1860 & 1878. Grand Lodge, AF&AM of Alabama. Grand Master: of the Grand Lodge AF&AM of Alabama 1845 – 1846. Chapter, Tuscumbia, Ala, is dated Aug. 10, 1885, and is signed by W. R.
Julian, J. D. Inman, I. T. Cooper, committee; W. T. Roland, H. P.